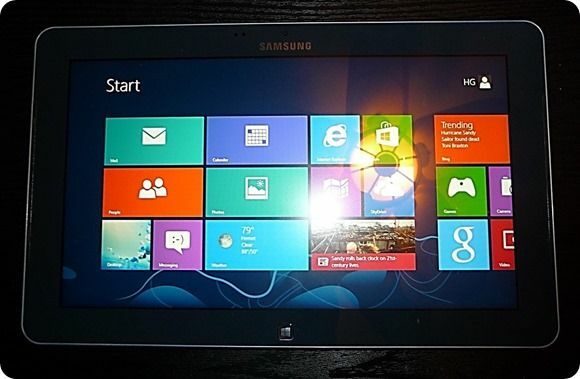 With the release of Windows 8, Samsung has finally released the ATIV Smart PC. The ATIV has the new Atom processor known as Clover-Trail. With the Clover-Trail processor, we should see better performance compared to the previous version of the Atom processor. So if you have been on the fence on purchasing a tablet running full Windows 8, and not the Windows 8 RT version, the ATIV Smart PC has the power and is very thin and portable like the current iPad and Android tablets but is much more capable. The ATIV Smart PC has the ability of running full Windows 8 application without compromises and run the Metro apps. For specifications and more information and links on the Samsung Ativ Smart PC 500T, see our information page. The Samsung ATIV Smart PC is equipped with the new Intel Atom Z2760 dual-core processor capable of maxing out at 1.8GHz. It runs full Window 8 applications, includes the Intel graphic media accelerator 3650 an 11.6-inch 1366 x 768 display with 400nit, a 2mp front and 8mp rear cameras, 2-speaker system, 2GB of LPDDR system RAM, 64GB SSD with 41GB free, 802.11 a/b/g/n, Bluetooth 4.0, 30wh battery and option docking keyboard with internal battery for all day computing. Let’s do a quick walk around of the ATIV Smart PC. For starters, having a full size USB 2.0 on such a thin device is something I have always needed. Usually other current tablets you need to purchase some type of cable or dongle to be able to transfer files or pictures to your tablet, unless you use Dropbox or Box to keep your files synced. This of course requires for you to be connected to the internet. This works best when sharing files between other users in a meeting or on the road with a flash drive. No need to pull out a dongle, especially when you want to carry as little as possible with you. Don’t forget that you also can charge your mobile phone, so in theory the ATIV Smart PC is your phone charger as well. USB external hard drives will be no problem. Just plug in your USB hard drive and access all your files you need. You don’t have to worry about the external hard drive not going to work because not enough power from the USB port, since the ATIV Smart PC is a full computer you will have enough power coming out of the port. Also on the top next your USB port you will find the Auto rotation button, power on/off button, dual microphone and your headset jack that is also your external microphone jack as well. The Samsung ATIV Smart PC has a microSD slot that is capable to read 64GB microSD cards. This on top of the 64GB SSD can give you some great storage options. I have a 32GB microSD card installed in the ATIV Smart PC, which I use for all document storage and I have installed Microsoft Office 2010 to run off the microSD card. This isn’t possible with Android tablets or an iPad tablet at this time. I haven’t tried this on the Microsoft Surface tablet, will have to give it a test later. I also have my Google Drive to use the microSD card to sync my files. 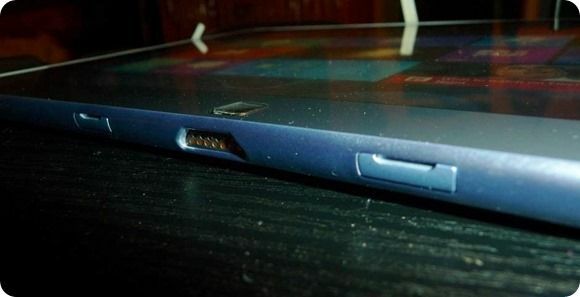 The port next to the microSD slot is for the ATIV Smart PC that will come with 3G built in, so at this time, it is only a cover. To the right of the Samsung ATIV Smart PC you will find nothing but a smooth edge, by the way the tablet is designed in such a way that it rounds off at the ends making it comfortable to hold in your hand in either portrait or landscape mode. No sharp edges. On the bottom you will find the port to dock the optional keyboard. The magnetic catch will allow you to drop the ATIV Smart PC into the docking keyboard which also houses a built in battery to extend your mobile experience. I wasn’t able to get the keyboard dock at the moment, but I am looking forward to picking up the keyboard dock to give it a test. I would like to see how well the keyboard keys are, and also to give it a test with the battery life. In comparison with the MacBook Air 11.6-inch, the ATIV Smart PC will be just a thin as the MacBook Air at the thickest part of the MacBook Air. This would also put the ATIV Smart PC at about .37kg heavier than the 11.6-inch MacBook Air. This is only with the optional keyboard dock. Samsung has decided to add the PSU at the bottom of the ATIV Smart PC, which can be a plus if you are not planning on using it on a stand, but I can see that Samsung wanted to keep the sides of the ATIV Smart PC clean. Lucky that my stand I am using is high enough to allow me to charge the tablet and at the same time keep it on the stand. 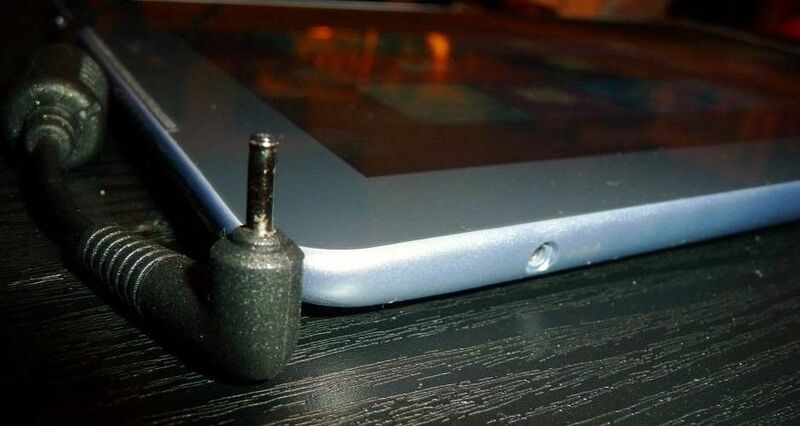 The charging tip is an â€œL inch shape allowing me to charge the tablet without any problems on my stand. On the left side of the ATIV Smart PC you will find the volume button and the micro HDMI port. The volume button is in one piece with the ability to press on the upper part to raise the volume or press the lower part to lower the volume. The button feels solid when you press the volume control. Again many tablets don’t have built in HDMI. I would have liked to have seen a full size HDMI port, if Samsung was able to get a full size USB, would have been nice to see it for the HDMI also. I tested the ATIV Smart PC to run on my 24 inch monitor and used it as my work machine; everything ran smooth without any noticeable lags of any kind. This just worked as my current setup I am using for work, which is the Samsung Series 7 Slate tablet. Never the less, having the micro HDMI is great, this will only require me to carry one cable for when I need to use the Samsung ATIV Smart PC to my 24 inch monitor. 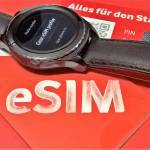 Nice review Hector. Are you sure the keyboard comes with a battery inside? I’ve been running Windows 8 on my desktop since February, upgraded to the retail version last week. I’ve had no problems with the new interface, I just work in the desktop. I almost bought this PC as it looked like a good upgrade but thought I’d try Win 8 on my Fujitsu Q550 first. I’m glad I did because I’ve found a deal breaker. What the hell have Microsoft done to the TIP? It’s almost unusable compared to the one in Windows 7. Does anyone know if it’s possible to get the old one into Windows 8? I’ll be sticking with my Q500 with Windows 7 until I find a solution. @John, Thanks. Some of the retailers selling the dock, mention that battery life will be increased through the docking station. I also have been using Windows 8 since the Developers Preview has been around. I have it installed on my Samsung Series 7 Slate Tablet, and I know what you mean. The TIP worked perfect whether you were in the Desktop mode or the new Metro UI. What Microsoft did was remove the TIP from the Desktop UI. Why? I say bad move! I also really used and liked the ability to just use my stylus or tap on a entry field and have the keyboard pop up automatically. In my case when I used the stylus to tap on a field to fill out, the writing box would pop up just like in Windows 7. So here is to hoping Microsoft would bring back the TIP and the stylus pop up. Really a shame about the samsung build quality. 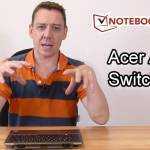 Based on the RT version of the Asus I believe the Asus 810 is going to have the best atom based build quality but no inbuilt space for the digitiser/stylus is a bit of a bust really brings the field back to Samsung / Lenovo / Dell. I was pretty impressed with the multitasking with the side by side and glad that inking is fluid. That combined with the battery life has sold me on the atoms. Word on the street is a few of our retailers in Aus started to get stock in today so until I can get my hands on a Lenovo might pick this up and return to the world of digital notes *sets fire to paper note pad* for the first time since the Dell Xt. Still a shame MS seemingly disabled inking on RT. From the current Asus Windows RT tablet and the upcoming Asus 810, the casing will be much better and not be much heavier. It is a nice feature to have a place to put the stylus right on the tablet and also the speakers on the front vs the Asus will be much better on the ATIV. But overall, same specs so it might come down to user preference and availability as well. If Samsung can get the ATIV out, they will sell. 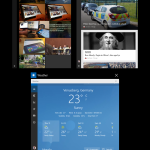 Multi-tasking has been very good as, and tested as my main PC for a week. That worked out great as well. Used my mini HDMI to my 24″ Samsung monitor, with Bluetooth keyboard and mouse. Hi! Had a few questions about this product. Thank you so much for the great review!! I cant remember all my questions right now, but firstly, what is the max resolution output using the hdmi? Is it the same as the samsung screen or is it any higher? Thank you! Sorry for such late response. The HDMI out from the ATIV matches your monitor resolution. I have connected to my work monitor which is I believe 1980 x 1280 or might be 1980 x 1600. But it works great with no problems that I can see. I have also purchased the ATIV non-pro, principally for One Note. I got the free version for Metro Mode – it had pen lag so serious as to be unusable. In fact I returned it. Then I saw this video, where the pen is just fine… hmm. Turns out the One Note for Desktop (Office 2010) is absolutely fine – no lag at all. I hope MS and Samsung manage to communicate this. It is nothing less than a showstopper if you are looking to use the Pen + One Note. For me, I am now back to being a customer. Yes the OneNote app and also the mini s note app has a lot of lag. This is not good as Microsoft is trying to show that Windows 8 is a tablet friendly OS. Hope that it gets fixed soon from Microsoft in a update. Also there is a few apps in the Microsoft Store that you can use the stylus and works pretty good for those that want some type of note taking app, besides the S Note app. Super Notes in the Microsoft Store works great, you do get the ads though. Yes there is something with the way metro apps run. I believe the Snote mini app also lags quite severely whereas the full Snote app runs fine. I grabbed a unit with Keyboard dock and can confirm it has no battery in it. So far on a full burn down @ 70% Screen Brightness I have maxed 7 hours. I suspect Intels claims of 10hours media viewing are true as after the battery was recalibrated @ 50% brightness+wifi/Bt/NFC off an hour of 1080p drained 8% the battery. Overall quite impressed with the unit. Build quality on mine seems better than Hugos but still plasticy. Think my main gripe is the screen is a fingerprint magnet. The Asus 810 claims to have tech on the screen to minimise/reduce fingerprints so could be a winner albeit for $200 more. I think I’m leaning to the Samsung because they all seem to have long battery life (14 hours+) but I want that stylus pen built in on the tablet. It seems to be the only one. I will mostly be using this for work. MY ONE CONCERN is of what appears to be a fan outlet or something on the edge of the samsung tablet. What is that? Is that going to prevent it from being in a bag for an extended time? As for which one to buy, kind of depends if you are okay with the Samsung ATIV build. Not that it is built poorly, just many users don’t like the plastic back. I ended up exchanging the first ATIV, I no longer have the squeaky back plastic. Feels solid. 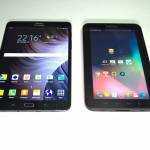 Your choice are very good, just keep in mind that the Samsung ATIV will be the lower price of all. I am still using the ATIV as a daily PC/Tablet and really like the portability of the tablet. 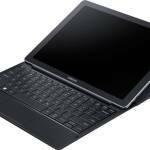 For my main power desktop applications I have my Toshiba Z935 and Samsung Series 7 Slate Tablet. I can confirm like Osiris mention, I am getting great battery life and the Atom processor is fanless. On Thanksgiving gathering, I brought some gadgets for the family to check out and the ATIV was one of them. This thing was used from about 4:00 P.M. to about 12:30 A.M. by everyone and was at 40% battery life left. Amazing! Thanks for the review. I have difficulty finding reviews of this beast elsewhere really appreciated. May i ask how well the atom version works for dreamweaver, photoshop? Have you ever played a mkv or avi and what’s the performance? I haven’t loaded up Photoshop or Dreamweaver. I have played AVI files and played just fine. The ATIV might not be a good choice for those high end applications, but for about 90% of the general use the ATIV is a great PC/Tablet combo. When you say, “I do have to say that using an 11.6-inch tablet for note taking does take some time to get use too.” Did that mean you had to get used to it being bigger or smaller than you’re used to? Yes I meant bigger, I had been using my Galaxy Note 10.1 as my note taker. Even though I do have the Samsung Series 7 Slate which is basically the same 11.6-inch display, but really hadn’t used it as my note taking device since it is a bit thick. Now I have gotten use to the keyboard dock and is working great. Easy to just grab from the keyboard dock and read some news, browse the web and check email without any problems and best part. I can reply to emails with stylus as I did a bit with my other Series 7 Slate. Is anyone running into a problem with the space key on the keyboard dock? On mine, I need to press it harder than other keys in order for it work. Seems like this happened right after running the SW update, so I’m guessing it might be a driver issue. Please comment if you’ve run into this problem. I have tested two different keyboards and none have had that issue. I also have the latest software updates and including the BIOS updates and space is working good. I say you should exchange it for another keyboard dock. Might get worse later in time. @Chippy, Can I Charge the samsung ativ through the usb port connected with a usb cable connected to my laptop or desktop? 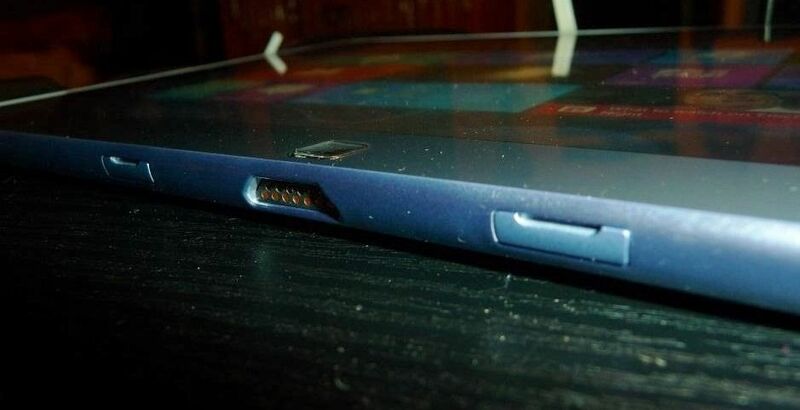 You won’t be able to charge the ATIV with the USB port. You need to use the PSU to charge it. 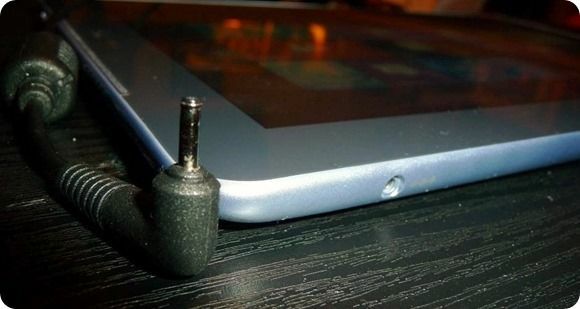 from what i understand, you have been using this tablet for almost a month now. According to some review, this tablet has some issues like the longer they used the more laggy it becomes, and the spen being useless most of the time. Can you confirm/ contest this? and if it is in the dock, can you charge it? thanks!